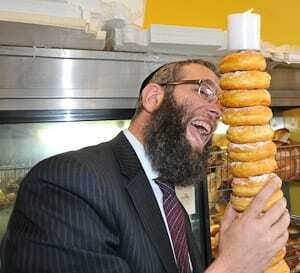 Every Chanukah, Rabbi Mendel Kastel dreams up a new menorah…and this year he will light a Menorah made from doughnuts. 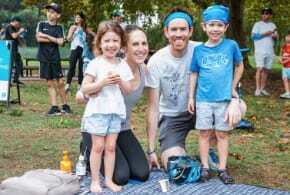 J-Wire visited the Carmel Cake shop in Bondi’s Oxford St Mall with Eastgate’s Ashleigh Johsnon from the Eastgate Shopping Centre who are sponsoring the Menorah. Carmel boss Hanan had the first batch ready and slotted through the first holder with the candle on top already lit. But Rabbi Kastel’s passion for doughnuts may exist as a threat to the entire operation as J-Wire, Eastgate and Carmel joined forces to stop him devouring the Menorah prototype! The Menorah will be lit on the fourth day of Chanukah, December 5 in the Mall outside Carmel at 2:30 p.m.